2018 Westcoast Rotary Sevens' Day Saturday July 7th, 2:00 p.m. Abottsford B.C. Following the very successful Westcoast Rotary Sevens Day on July 7, 2017, Force Fed Performance will again host this year's Sevens Day at their compound in Abbotsford, B.C.. Call is out to all in the West to plan to attend. This is a grass roots level event with no admission. Cruise-ins and Cruise-outs and a long course cruise, the following day, are being planned. Last year we had 55 rotaries attend (FD, FC & FB). We expect to exceed this number this year. Follow developments under the Canadian Forum. I was just saying when I read this on the Pac NW page that I could be interested in taking the drive up the 1, would have to leave Thursday. Anyone in? 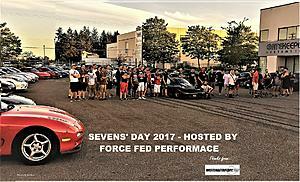 Momentum is building for Seven's Day at Force Fed Perfomance in Abbotsford on Saturday, July 7th. Marco and Taylor are saying they plan to fire up the BBQ around 1:00, so those arriving early won't go hungry. Seven's Day two days away. Hope to see you all at Force Fed Performance in Abbotsford, B.C., this Saturday July 7th starting about 1:00 pm. Quick Reply: 2018 Westcoast Rotary Sevens' Day Saturday July 7th, 2:00 p.m. Abottsford B.C.